:There is a way to confront problems in life, shake them off, and move on. 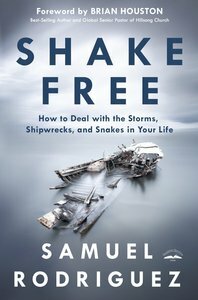 About "Shake Free: How to Deal With the Storms, Shipwrecks, and Snakes in Your Life"
Samuel Rodriguez, Jr., is the president of NHCLC/Conela, an international organization of more than 500,000 evangelical churches (over 40,000 in the U.S.). Born to Puerto Rican immigrant parents, Rodriguez is recognized as a prominent Latino Christian leader in America: in 2013 Time Magazine nominated him as one of their "100 Most Influential People in The World." I couldn&rsquo;t believe where I was and what I was doing. Although I had stood at many different podiums around the world and offered many prayers, both silently in the pew as well as publicly from the pulpit, this time was different. This time the eyes of the world were upon me as I took center stage on the platform only a few feet away from the president-elect just moments before he would become our nation&rsquo;s leader. A vast sea of faces from the hundreds of thousands in attendance at the inauguration looked up at me beneath luminous pewter-colored clouds. As I made my way to the podium on this mild, damp January morning, I shivered despite my gray overcoat, more from being nervous than from the weather. Taking a deep breath, I paused to celebrate all that God had done in my life to bring me to that moment. There I was&mdash;a Puerto Rican computer geek from Bethlehem, Pennsylvania&mdash;standing before millions of viewers in the very spot where Chief Justice John Roberts would soon swear in the president of the United States. Back in high school I was more concerned with the next Star Trek movie than anything to do with ministry. Never in a million years would I ever have imagined myself a pastor, let alone one about to deliver a prayer for our nation&rsquo;s new president at his inauguration! Although I had been involved in several nonpartisan meetings with previous presidents, I was about to make history as the first Hispanic evangelical pastor to pray at this historic and prestigious event. Humbled to be there, I delivered the prayer derived from Scripture that God had placed on my heart and knew this moment was as monumental for me as for our new leader. Months, if not years, had led to where we each stood. After a grueling campaign and divisive election, the president would now move forward to unite us as one nation under God. My route had also been a long, arduous journey, filled with more ups and downs than any roller coaster ride. (I&rsquo;ll tell you more about some of those later.) But then, isn&rsquo;t that true for all of us on our journeys of faith? Some days it feels as if we take one step forward and two steps back before we experience God&rsquo;s guidance toward the destination where he wants to take us. Sometimes we may even wonder whether we&rsquo;re going the right direction or whether we&rsquo;ll ever get where we believe we&rsquo;re supposed to be. We feel overwhelmed by and underequipped for life&rsquo;s storms and struggle to push through one obstacle, only to discover another larger one looming before us. In other words, we feel just like the apostle Paul boarding a ship. Like most parents, if I had a dollar for every time one of my kids asked that inevitable question while traveling, I&rsquo;d have a pile of money. But children aren&rsquo;t the only ones who get impatient. Every time I board a plane, I check my watch and wonder whether my flight will be on time&mdash;the first of many such calculations. When delays leave me sitting on the tarmac along with dozens of other frustrated, impatient passengers, I try to remember the journey Paul took in order to get to Rome. As we will see, this trip was anything but simple. And even if Paul didn&rsquo;t expect smooth sailing, I doubt he imagined anything like what actually occurred on his epic journey. Filled with an arrest, a trial, a life-threatening storm, a shipwreck, and a snakebite, Paul&rsquo;s path to Rome featured more drama than a reality TV show. Surely there were times when he had to wonder whether he would ever reach the capital of the Roman Empire. Maybe he questioned whether he had misunderstood what God wanted him to do or how God wanted him to do it or whether he had lost his sense of direction somewhere along the way. Perhaps Paul&rsquo;s commitment to walking by faith despite his circumstances resulted from the dramatic upheaval he experienced in his life after encountering Christ. You see, Paul had once been known as Saul before he ran into Jesus while traveling on the road to Damascus. Raised in a strict Jewish home, Saul believed a person&rsquo;s righteousness could be achieved only by strictly following God&rsquo;s law. Consequently, Saul thought he and other Jews like him were the only ones worthy of God&rsquo;s favor because of how hard they worked to follow every commandment and obey every rule. But Jesus came to fulfill the law and deliver all people&mdash;including you and me&mdash;from their sins once and for all. His gospel message of grace ran counter to virtually everything Saul, a strict Jew, had been taught and practiced his entire life. This explains why Saul persecuted the early followers of Jesus; he considered them heretics because they were going around telling everyone about grace and forgiveness in the name of Jesus Christ. After his personal encounter with Jesus, however, Saul began doing the very thing he had once so violently opposed: spreading the good news beyond Israel by traveling and preaching to Gentiles in foreign lands. Along the way, he also began going by the Roman version of his name, Paul, both to show the change in his identity and to escape his reputation as a persecutor of Christians. Throughout his travels, Paul often wrote letters to the communities of believers in these distant locations, and many of these divinely inspired messages became part of what we call the New Testament. We also know a lot about Paul&rsquo;s life from the narrative we find in the book of Acts, which most scholars believe was written by the same author as the gospel of Luke. Consequently, Paul emerges as a superhero of the Christian faith who continues to instruct us, inspire us, and ignite our hearts toward God today. As we will discover throughout these pages, Paul faced more pulse-pounding, life-or-death, cliff-hanger situations than Indiana Jones and Jason Bourne combined! From angry mobs eager to kill him to shipwrecks and jail cells, Paul faced each new trial with patience and faith. Throughout all these twists and turns, however, Paul knew he would eventually get to Rome because that&rsquo;s where God wanted him to be. Far from being a vacation destination, the center of the Roman Empire was probably one of the most dangerous places in the world for Paul. Now known as the Eternal City because of its ties to ancient history and its timeless works of art and architecture, in Paul&rsquo;s day Rome was not only the capital but also the center of the most powerful military empire on the planet. Consequently, Rome served as the United Nations of the early first century because of its diverse population, a result of the expansive conquests of so many tribes and nations. England, Spain, Syria, Israel, and much of what we now know as Western Europe and North Africa all belonged within Rome&rsquo;s grasp. At the time, all roads literally led to Rome. Paul was on his way to Rome for a much more unusual reason than most of the international travelers of his day. He was en route to Rome because God wanted him to have a larger platform to amplify the narrative of this new faith known as &ldquo;The Way,&rdquo; the early name for the beliefs of those following Jesus. But Paul was not going under the best of circumstances. In fact, on the surface they look like the worst of circumstances. He wasn&rsquo;t going on vacation aboard a Royal Caribbean cruise ship or enjoying sunset views of the Mediterranean from the deck of a yacht or even a fishing boat. No, Paul sailed for Rome as an inmate on a prison ship! Arrested for creating a disturbance in Jerusalem, Paul went before a council of leaders only to be found not guilty (see Acts 25&ndash;26). Because so many of his fellow Jews continued to harass him, he nonetheless asked to go before the Roman courts to put the matter to rest once and for all. We don&rsquo;t know for sure, but I suspect Paul also wanted the opportunity to share the gospel with such an influential political audience. Regardless of his motives, Paul continues to serve as an incredible example to us today of someone willing to go the extra mile&mdash;or in this case all 1,433 of them, the distance from Jerusalem to Rome as the crow flies&mdash;to advance God&rsquo;s kingdom. No matter how rough the sailing or how impossible the situation, Paul refused to give up his firm belief that God was still in charge. Paul knew he would eventually get to Rome one way or another. Paul&rsquo;s journey to Rome inspires us to persevere no matter what life throws at us or how big the obstacles appear that block our paths. You may never have been to Rome, but I&rsquo;m guessing you&rsquo;ve encountered enough storms in life to know that the sailing is seldom smooth for long. Maybe it&rsquo;s because we&rsquo;re all plugged in and connected by social media, but it feels as though our world is a scarier, more dangerous place than ever. Hurricanes and wildfires. Horrific mass shootings and terrorist attacks. Economic downturns and corporate layoffs. And beneath all the headlines and sound bites are the lives of families, men and women, children and teens, trying to keep going in the midst of each crisis or disaster. Trying to get through another day while grappling with the pain of a lost loved one, a home destroyed, or a job terminated. Working to keep food on the table, catch up on overdue bills, and support ailing parents. Fighting to not give in to discouragement and despair, to the unfairness and injustice all around them. If I&rsquo;ve learned anything during the past two decades of being a pastor, it&rsquo;s that you never know what another person is going through. Most days this awareness motivates me to be kinder to my waitress or more patient with the driver in front of me (quite a feat in California!). But then sometimes my own struggles and weariness consume my attention and I lose sight of the pain of others. I begin to long for heaven with renewed vigor, eager to escape the latest crisis or the daily struggle. Those are the moments when, just like my kids on a long trip, I ask, &ldquo;How much longer? Are we there yet?&rdquo; And then God reminds me, often in some surprising way, of his love, his concern, and his presence. My hope is that this book will be one of those uplifting and unexpectedly refreshing encounters, a way for God to speak in your life and whisper, Keep going! You&rsquo;re on your way and I&rsquo;m still with you. You&rsquo;re going to make it to Rome, no matter how impossible it looks right now. Sometimes we look at individuals in the Bible as far removed from our present, everyday struggles to work hard, push through, and keep our families together. But I doubt any of them felt any differently than you and I feel when trouble came knocking on their doors. Maybe that&rsquo;s one of the reasons Paul compiled a list of great men and women of faith to encourage other believers. While some scholars question the authorship of the New Testament book we call Hebrews, I believe Paul wrote it. He knew that all the saints listed in the great Faith Hall of Fame, found in Hebrews 11, probably faced the same feelings, thoughts, doubts, and worries that you and I have faced or may be facing right now. He knew that they were just as human as anyone else yet were willing to trust God in their painful, crazy, uncertain struggles. They were willing to keep getting up every time they got knocked down. In this passage Paul was not simply defining faith but was showing us examples of faith in action. He understood the big difference between knowing something in theory and experiencing it personally, between hearing it taught once or twice and living it out every day. In writing to other early followers of Jesus, Paul wanted them to persevere in their faith no matter what their circumstances might be. He knew all too well how hard trials can seem and how challenging it becomes to trust God when life goes sideways and our expectations go unmet. Paul reminds us that it was just as hard for all those great pioneers of our faith. It&rsquo;s easy for us to assume that Noah&rsquo;s bedrock faith empowered his confidence to build the ark without a cloud in the sky. But it must have been really tough listening to all his friends and neighbors mock him and laugh at what they considered crazy behavior. I suspect it was the same with Ruth and Naomi. Why in the world should Ruth leave her home and everything familiar&mdash;especially after losing her husband unexpectedly&mdash;to follow her bitter mother-in-law, Naomi? It&rsquo;s easy to admire Ruth&rsquo;s faith after the fact because we know that Boaz was waiting to marry her in a happily-ever-after ending in Bethlehem. But during that long, dusty journey from Moab to Israel, Ruth probably had her doubts. Or consider Job. If anyone deserved to give in to doubt and give up on God, surely he&rsquo;s at the top of the list. Job endured just about every loss imaginable: his children, his wealth, his wife, and his health. Still he refused to blame God and instead clung stubbornly to the irrational belief that his Creator loved him and had not forsaken him, even when everyone around him thought otherwise. I certainly hope you haven&rsquo;t lost as much as Job did, but I&rsquo;m guessing you&rsquo;ve felt the same intensity of grief, anger, and fear that he may have felt. You may not consider your faith to be as strong as that of these heroes of our faith, but it is. It simply takes a willingness to keep going during life&rsquo;s ups and downs, to trust God when you can&rsquo;t understand what he&rsquo;s up to. This is what &ldquo;going to Rome&rdquo; is all about&mdash;staying the course to follow God through the many trials, temptations, and tangents of your life. Trusting that he has your best interests at heart as he leads you forward. Glimpsing eternity and your home with him through the peace, joy, and satisfaction that comes from reaching your ultimate destination.